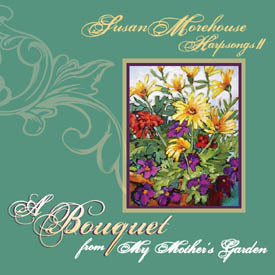 At an Open House for family and supporters today, Susan will be introducing her new harp CD Harpsongs II – A Bouquet from My Mother’s Garden. The album is a 65-minute “bouquet” of 22 classical, Celtic, and spiritual pieces, several of which feature Nicole Ferguson on the flute. If you would be interested in obtaining a copy, please visit Susan’s website or contact her directly.